TLC is keeping it in the family. Season 6B of the Sister Wives TV series premieres Sunday, May 8, 2016. Watch a preview, below. Fans will be treated to super-sized episodes in a new timeslot. In the upcoming installment of Sister Wives, the Browns deal with the aftermath of Meri’s catfishing scandal. The season isn’t all angst, though. The Brown family will welcome baby Ariella Mae. Also, Madison moves to Montana to be closer to fiancé Caleb Brush. 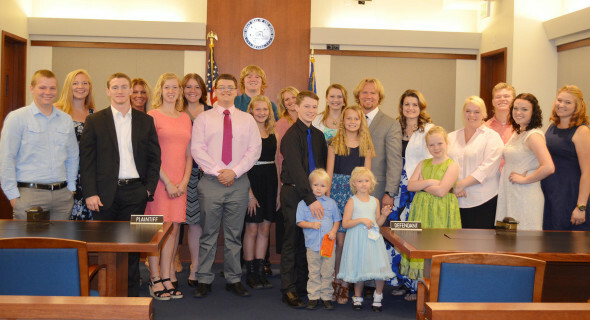 The cast of Sister Wives includes: Meri Brown, Kody Brown, Christine Brown, Janelle Brown, Robyn Brown, Mariah Brown, Hunter Brown, Logan Brown, Madison Brown, Mykelti Brown, and Paedon Brown. Watch “This Season on Sister Wives,” from TLC. Get more information on the upcoming season of TLC’s Sister Wives TV show, from this press release. (Silver Spring, MD) – It has been a year of ups and downs for the Brown family, and viewers will watch it all unfold when new episodes return for a supersized season beginning Sunday, May 8. Marriages, births, and relationship struggles will be served up for two hours every week in the all-new time slot for SISTER WIVES from 8PM-10PM ET/PT on TLC. Kody and the sister wives – Meri, Janelle, Christine and Robyn – are put to the test like never before after Meri confesses to being catfished into an online relationship with a woman impersonating a man. The family – devastated and confused—struggles to come to terms with the situation and enlists the help of their therapist to begin the long healing process and build back the trust that was lost. Despite this family conflict, there is still plenty of celebrating within the Brown household as wedding bells and a new baby are in the near future. Madison takes her relationship with Caleb to the next level, announcing to the family that she is engaged and moving to Montana to be closer to her fiancé. The news is met with overwhelming excitement and everyone wants to be a part of the planning process. With one of their older children preparing to walk down the aisle and another about to enter the world, the Browns have their hands full. Robyn and Kody have the final meeting with their midwife before the birth, and they do their best to prepare Solomon for his baby sister while the rest of the family waits to welcome the Brown’s 18th child. There is a chance that this could be the last baby to enter the Brown family and it will be an emotional one for everyone. On top of the world after the birth of beautiful Ariella Mae, the Browns get another amazing piece of news – the entire family is going to Hawaii! The trip is simultaneously spectacular and totally crazy, as the dynamic of traveling with that many people and personalities always is; but it gives the family much needed time to bond and reconnect after an emotionally exhausting year. Kody: 48-years-old, father of 18 children, husband to four women – Meri in April 1990, Janelle in January 1993, Christine in March 1994, and Robyn in May 2010. Meri (first wife): 45-years-old, married 25-years and has one daughter named Mariah, 21. Janelle (second wife): 47-years-old, married 23-years and has six children – Logan, 21; Madison, 20; Hunter, 19; Garrison, 18; Gabriel, 14; Savanah, 11. Christine (third wife): 43-years-old, married 22-years and has six children – Aspyn, 21; Mykelti, 19; Paedon, 17; Gwendlyn, 14; Ysabel, 12; Truely, 6. Robyn (fourth wife): 37-years-old, married five years and has three children from her last marriage – Dayton, 16; Aurora, 14; Breanna, 12. She has two children with Kody – Solomon, 4; Ariella, 3 months. SISTER WIVES is produced by Figure 8 Films in association with Puddle Monkey Productions for TLC. What do you think? Are you a fan of TLC’s Sister Wives TV show? Do you plan to check out the season premiere? More about: Sister Wives, Sister Wives: canceled or renewed?, TLC TV shows: canceled or renewed? Who’s dumber: a catfishing victim or a plural marriage victim? Oh, wait, Meri Brown is both, she wins! Have you noticed when tlc programs get low ratings they go on a big trip? Rollofs,Europe,Duggars world tour,Kate & cheater Hawaii? Little couple India it goes on and on. Meri had an innocent little flirt online, just joking and harmlessly playing around. Kody has a new bride lined up to produce more children to honor the family. Sorry.. This is real? Well if it is.. It makes polygamy seem like a horrible thing..Just exactly what any woman would go through if she had a cheating husband..
Mariah should be all for her mom finding someone to spend her life with..how selfish to expect her to live miserably the rest of her life.